I must admit I have no idea of the date,possibly early sixties,sadly a few in the picture have passed on. 1950's a bit early, do you have any names Willie? Who would ever have thought that small Wullie would become a highly trained Broadband & Fibre engineer and still have the same size legs. Besides Wullie I immediately recognise Robert Mooney, Kenny Barnett and Jim Coltherd and I think Billy Sutherland, Sandra Bain plus a Barnett boy(sorry I can't remember his first name) who lived in Frasers close. Is that Jackie Barnett 4th from left, middle row ? 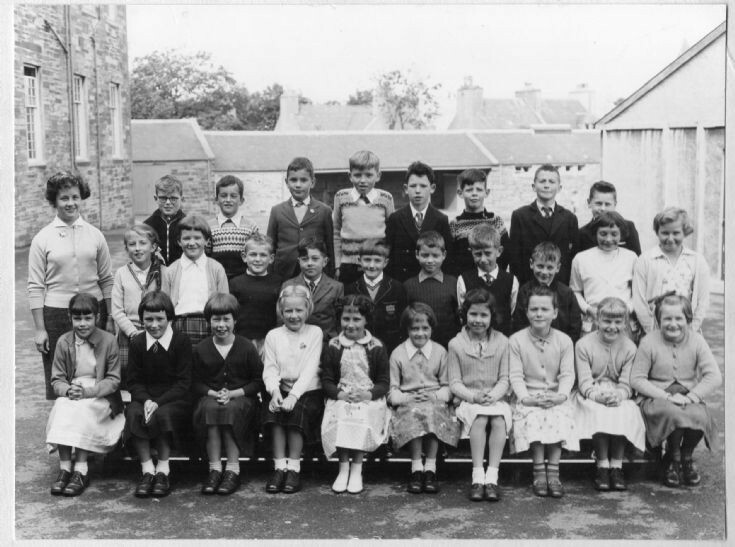 probably 1959;Kenny Sinclair, Colin Campbell, David Mitchell, Billy Sutherland, Stephen Morris, Kenny Barnett, Raymond Hay, Wattie Sutherland, Bobby Barnett, James Coltherd, Alan Rorie, Wullie Bews,Jean Leorard, Myrtle Hercus,? Borwick, Ruby McKay, Ann Smith. Could Be wrong! Front row 3rd from left Janice Spindler. Maybe Joey would know all the names? Back row :- Kenneth Sinclair,Colin Campbell, David Mitchell,Billy Sutherland,Stephen Morrice, Kenneth Barnett,Graham Rosie,Raymond Hay. Front row:-Jean Leonard,Jennifer Irving,Janice Spindler,Margaret Spence,Isline Leask,Hazel Ogg,Irene Swanney,Linda Borwick,Ruby Mackay,Kathleen Smith. Graham Rosie, back row second from the right, is correct. He went to sea and now lives in Broughty Ferry.